THE MODERATOR: Questions in Spanish, please. Q. Rafa, do you have an all‑round match against Simone today. Years ago Djokovic lost against Dimitrov and decided not to come this year. I want to know your opinion about that, and what do you expect from Dimitrov in the quarterfinals? RAFAEL NADAL: First of all, Novak I think that he has won so many things that he has the freedom to choose when he wants to rest and when he doesn't want to rest. So nowadays we just have to say that he's been doing great. We all have our preparations and training, and I think that perhaps the fact of the altitude here, he's been playing well at sea level, and I think he still wants to do that. He just wants to take his time off. Dimitrov it is an all‑round player, one the best in the world for sure. He won three matches here, so that means he's playing at a really high level again. I'm conscious that the only way to beat him is to play an all‑round game. I think that today he has done a really good game against Wawrinka, and the one before against Fognini, too. He's been winning good, high level matches. He's ready to give his highest level. Hopefully tomorrow I'll be ready to compete against him. Q. Yesterday you were saying that you had to celebrate. Today you have more reasons to celebrate. Are you satisfied? RAFAEL NADAL: Yeah, I think I played a correct match, a little bit better than yesterday's. As I was saying yesterday, each day we can do more positive things. Yesterday I did the minimum in the first set, a little bit more in the second one, and today I did a little bit more. Since the beginning and managed to maintain a good level throughout the match. It's not been incredible, but I think it's an acceptable level. I'm happy with the level I had today. Now I'm going to rest and prepare for tomorrow with joy. I'll try to just step up again. It's an important victory today. I made it to the quarterfinals. Well, nowadays we have to be happy about everything that I achieve. I have to be happy about all the victories. They are really valuable. I'm happy, and let's try to be ready for tomorrow. Q. Two matches, and you served really well in both of them. Is that important to continue for the tournament? RAFAEL NADAL: Well, vital. It's always very important. But especially here with the altitude it's very, very important. It's very important not to give many options to anyone to break you, because you know that you're not going to be able to break a lot. If the opponent is serving well, it's very complicated to return the ball. Here it's difficult to move around in the court. So, yeah, I think that the serve is something that's working quite fine. Let's just keep going on the same path to have options. Q. You've already said that in Madrid you're not at 100%. Talking about Rome, do you think you'll be in the highest level there in order to go to Roland Garros in your best shape? Do you think that after Madrid you're going to go to Rome in your best shape? 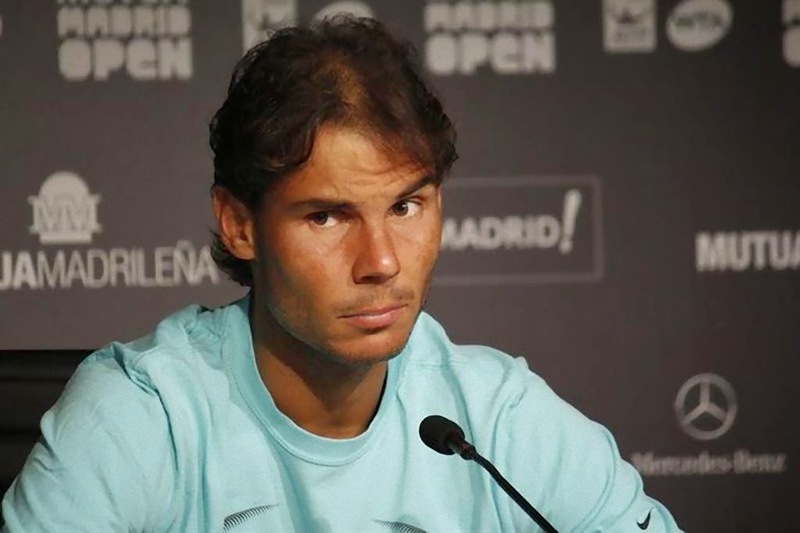 RAFAEL NADAL: I never said anything like what you're saying. I never said anything like that. You know, you've said that I'm going to be 100% here in Madrid or Roland Garros, and I really don't know. I don't know if I'm going to be to my best level here or Rome or Roland Garros. I really don't know. Or if I'm going to be at my best level in a month or two. I have no idea what's going to happen in the future. My goals nowadays are short‑term. I'm thinking in small goals: just to be happy with the small things that I have today, and just measure each step in a positive way. Really that's what I'm doing today. I don't have long‑term goals or very complicated to assimilate mentally talking, because I think today things are different to how they were a few months ago. Let's just try to make them similar to the conditions I had before. I have to start in the beginning. I start from zero playing every single point. I've been happy with all the victories, and that's what I'm doing right now. I made it the quarterfinals. I won two matches. That is very important for me. Tomorrow I have another opportunity to play here in front of my people. I'll just have fun and try to play a good match. That's the only way to have options. RAFAEL NADAL: I don't know, I don't know. I just look day by day and see what happens. Things just don't happen in a week. I played well in Monte‑Carlo. Seemed that I was back on the path, and then in Barcelona I didn't have the rhythm. If what happened last week in Barcelona didn't happen, and in Barcelona I confirmed what I did in Monte‑Carlo and here we had these two matches, I would tell that you I'm on the correct path. But today I think it's quite early. I have already won two matches. It's a positive vibe because I've been able to win them. Let's see what happens tomorrow. Tomorrow I have a complicated match. It's a test. Let's see where I am. We'll have to evaluate tomorrow's match. You know, today's match is just another match. I made to the quarterfinals and I'm happy about that. But tomorrow I have an opportunity to have positive feelings. I'm going to fight against a really good opponent. Let's see what happens. I'm not thinking about being back to that regularity that I had before. I'm just thinking about tomorrow's training and then trying to be positive for tomorrow's match. I just take day by day and evaluate every single thing. I think I have options to achieve important things. That's all. Q. I don't know if you saw yesterday's match, Federer and Kyrgios, but does it surprise you? Do you think that now we're going to change the generation of players? RAFAEL NADAL: How old is Dimitrov? Let's speak clearly. They are in different ages. Dimitrov is already a mature player. He's not a young player that's pushing. He's a really high‑level player and already been playing a lot of years on the circuit. That is completely different to Kyrgios. I understand that you're looking forward to seeing new, younger players coming up and players that are forcing that change in generations. That's going to happen. I don't know if it's happening right now, but of course we have seen a couple of young players that are doing really well. They are going to be the next generation of tennis players. But today in the race of the year, the top 5 are two players that have been a lot of years on the circuit. None of the young players that we're talking about are in the top 5. There are young players that have a lot of talent and things to fight for. Dimitrov is not one of them because he's been already fighting for a lot of years to be up there in top 10. So don't put him into that group. In this group we have Kokkinakis, Kyrgios, maybe I forget about some other players, but I don't know. Today I think that if they continue playing as they do week after week, they will have their options in a couple of months to fight for important things. Today I think that Djokovic or Federer or Berdych or Nishikori, they are very solid up there and playing very well. Murray also. Sorry. He is No. 2, I believe. Q. Are you training with Grigor? After today's match he said that you're always the favorite, especially on clay and here in Madrid. Tomorrow you'll have all the people behind you supporting you. Is there something that could worry you about his game? RAFAEL NADAL: Yeah, everything worries me about Dimitrov. He's a very good player. He serves well, very good forehand. Backhand, too. Slice also. He moves very well and has good footwork. He is a very complicated player. All round. Only way to beat him is to play at really high level. I think he has had more complicated matches than me this week. That's an advantage for him. Let's see what happens. I hope I'm going to be ready for the match and I'm going to have fun. I just have to do the correct things to have options. That's all. Q. Yesterday when you were leaving you said that one of the things that you wanted to do is to be able to see the football match. I guess that you also wanted to relax. Did you manage to make it to the football match? What did you think about the match if you watched it? RAFAEL NADAL: Yeah, of course I made it to the match. I could see it. I enjoyed a really good football match. I think that both Bayern and Barcelona played really well. It was an amazing game. I really enjoyed it to the maximum, especially in the last 15 minutes. Everything was decided. I think that there was a really important game yesterday, and just say congrats to Barcelona because they made to the another final. Sincerely. Why not say that the Spanish teams are doing really well? We had Seville fighting to play in the final of the UEFA, and the other Spanish team is also fighting to make to the final. So, yes. We always talk about Premier and other leagues. Of course here we have a competitive and good league. I think the Spanish league has really good teams. I think that nowadays they're playing at a really high level and dominating the European football. Q. You were saying that you're looking at small things to be happy about and not such big goals. How can you say that a player like you, with such good goals and big goals achieved in his career, you need to work on it? Now you're saying that you're looking at the small things. Is that new for you? RAFAEL NADAL: No, no, I never say that I'm looking for longer‑term projects. You've never heard me saying that I'm just thinking of the long‑term. I think you have never heard me in my career talk about those things. I'm not going to say that right now when I come from a dynamic that's not the right path. You know, the subject is quite clear: a player that has achieved what I have achieved, I managed to achieve that day after day, and not by just thinking when you win Roland Garros. You know, you're happy when you win the first round in Madrid, second round in Madrid, or Monte‑Carlo or any other tournament, even in smaller tournaments. From those small things, then you can step up to bigger things. So you know, my head is not working different to right now than in the past. It's not a new goal. It's always the same. But there are times that the goals are a little bit more difficult to achieve than others. Nowadays it's a little bit more difficult. That's all. I'm not thinking differently. Just the same way as always, and I'm going to work the same way. Q. This season in Rio you were set to go on court in a really late match. Yesterday Murray and Kohlschreiber went on court after 1:00 a.m. Do you think that's something that needs to change? RAFAEL NADAL: Well, I think that's didn't happen here very often, no? It's something that can happen few days and maybe we can think about another schedule. But it's true that today we have a combined event. We have girls and us playing here, so I think the girls need to have three matches on the center court, too. The schedule yesterday was unbelievable late because all the matches have been unbelievable long. Since the first one until almost‑‑ only my one was short. The rest of the matches have been crazy long matches. The matches start at 11:00. You cannot start at 9:00 in the morning a tournament like this one. Yesterday the schedule was perfect. Very unlucky and unusual day. It's a different story than what happened to me in Rio. They have full options to change things. They didn't make that change. Here the schedule, even if it's very‑‑ you know, it's not right to start the match at 1:00 in the morning. It's completely bad news for the players and for the crowd and everybody. Was a very unlucky day. Q. Just talk me through the match today and look ahead to Dimitrov tomorrow. RAFAEL NADAL: Well, I think today I played a little bit better than yesterday. That's something that is very important for me, that I feel myself a little bit better every day. Being in quarterfinals is very positive news. I am happy for that. Tomorrow I have another tough match, and the tougher match of the tournament already since the tournament start. So the only chance to really have chances to win is play on the very high level, no? That's what I going to try. I hope to be ready for it, but I know Dimitrov is a fantastic player and a player that he can win against everybody. Great talent. Q. How important is it for you to play good in front of the home audience, and what does it mean to gain more confidence before Roland Garros? RAFAEL NADAL: For me it's important play good in every tournament. Play in front of my crowd is only thing that can give me some help in tough moments, but always I try my best. If I play Madrid, in Rome, or in anyplace of the world, every time I go on court I try to play as good as I can. It's obvious that when you play in Madrid the energy from the crowd is very, very special and that give me extra positive energy, but that's all. Q. And the self‑ confidence? What does it mean in front of Roland Garros to gain more? RAFAEL NADAL: I'm in Madrid. I am not thinking about the confidence for Roland Garros. I think about try to have a good rest today and try to be ready for the match of tomorrow. Roland Garros is in three weeks. Let's see what's going on, what's happening here in Madrid and then in Rome. Obvious that I need to play well in these two tournaments to have any chance to arrive there with the right feelings.